With a stay at Tiantai International Hotel in Wuhu, you'll be within a 10-minute drive of Guangji Temple and Zheshan Park. Free self parking is available onsite. With a stay at Hanting Hotel in Wuxi (Bin Hu District), you'll be 5.7 mi (9.2 km) from Nanchan Temple Antique Market and 5.8 mi (9.3 km) from Sanyang Parkson. Free self parking is available onsite. 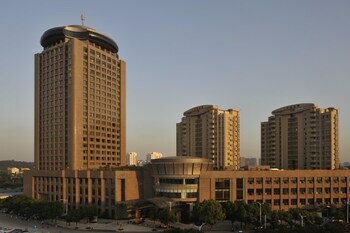 With a stay at Jingjin Hotel - Tianjin in Tianjin (Hexi), you'll be within a 15-minute drive of Tianjin Olympic Center Stadium and Tianjin Zoo. Free self parking is available onsite. With a stay at Le Jia Xuan Olympic Sailing Center Branch, you'll be centrally located in Qingdao, within a 10-minute drive of Qingdao University and Hisense Plaza.